We continuously invest resource to develop new product. Through various products, an interactive teaching environment can be established. 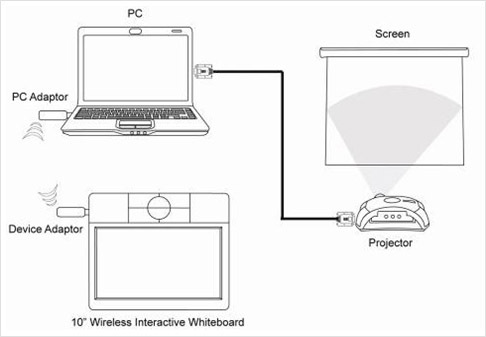 The wireless interactive whiteboard connects wirelessly to your computer from up to 6 meters away. In the e-learning classroom, teachers can freely move and directly interactive with students. With professional software-NXBoard, teachers can easily create innovative teaching skill and communicate new ideas with students. 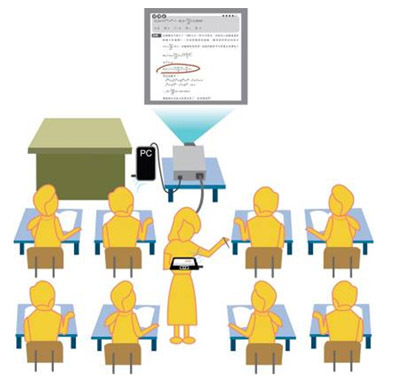 For example, teachers can freely walk from classroom platform to student's desk; therefore, teachers can get closer with students and students can easily write down something in the wireless interactive whiteboard. With a wireless design, 10" wireless interactive whiteboard help you get rid of those annoying cables and it allows maximum distance of data transmission 10 meters. Teachers can easily connect PC and wireless interactive whiteboard through wireless USB dongles including Wireless PC Adapter and Wireless Device Adapter. 10" wireless interactive whiteboard is built-in four hot keys for NXBoard software.